EZ2 Lotto: 11 am = 11 – 07, 4 pm = 15 – 11, 9 pm = 06 – 25 | Date: February 11, 2019 – Updated and verified EZ2 Results from the PCSO 2D lotto draw today (Monday). 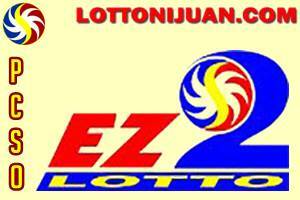 The February 11 2019 EZ2 lotto draw was held at the Philippine Charity Sweepstakes Office. In order to win the prize you must picked the correct 2-number combination in exact order. You can also check out the Swertres results. Note: The PCSO EZ 2 Lotto Results and Draws can be seen everyday with the following draw Morning (11am), Afternoon (4pm) and Evening (9pm) over Channel 4 together with your other Philippine PCSO lotto games. You can also see here the other Philippine lotto results. You can check out HERE the EZ2 DECEMBER 2018 Results History number frequency (madalas lumabas). The PCSO EZ 2 Lotto or 2 Digit is a game where you have a chance to win at fixed prize of Php 4,000.00 for every 10 pesos if you get the two (2) winning numbers in exact order. You can also play the EZ 2 Lotto through Rambolito which you can win Php 2,000.00 prize. You will pick two of your favorite of the one you feel the lucky numbers from 1 to 31 and if those numbers where drawn you win 4,000 pesos for every 10 pesos you played. The more tickets you have the bigger the prize is. There’s also 1 peso documentary tax for every 5 pesos played.